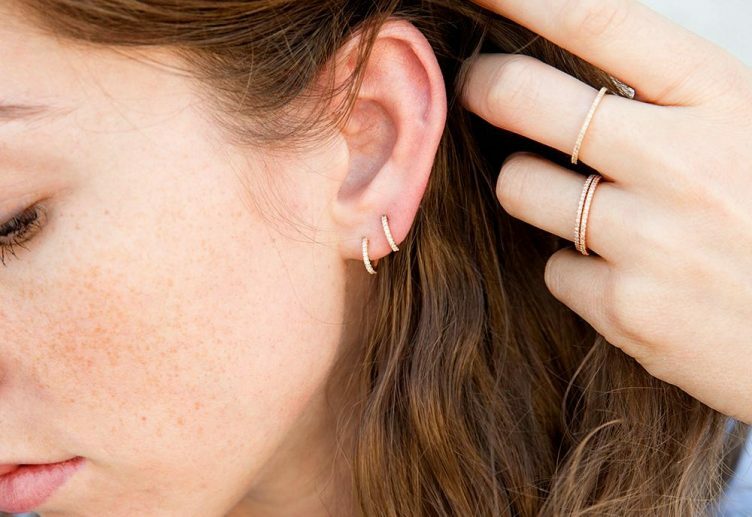 10 Best Small Hoop Earrings because Everyone Should Own a Pair! It’s not only because they’re classics that we’re saying you should own a pair. There are other reasons, but one that we see clearly is pretty simple actually. It all falls on the jewelry’s significance. If the jewelry is worth the trouble, people will most likely go for it. And that’s considering the fact that people will still go for a classic regardless if it’s even not that durable. This, in a way, stands as the 1st point in favour of small hoop earrings. Let’s see it this way together, people could buy this kind of earrings based on looks alone. As a matter of fact, we did too. It’s just that we decided to instead look into 9 more of what we saw and then see how they all work out. So, small hoop earrings are beautiful works of art that are not on the large side. And considering its bigger sizes, which in some scenarios aren’t that flattering, this is a nice option to have around. It’s an option for people regardless if they’re picky or not about the size of what they’re wearing. Also, if they’re worried about the effects the small hoop size will create in certain scenarios. So, a sweet gift idea for most people that you know. That’s your daughter, colleague, mother, etcetera. You don’t need to deal with the additional size, but you get the looks in a small package. At the same time, you won’t be missing out on the durability that the best ones come with. 10 of Our Favorite Picks! It’s a favorite and the reason for that is in the design of the earrings. Hoops & Loops uses the classic hoop style and then twists the metal along the circle. 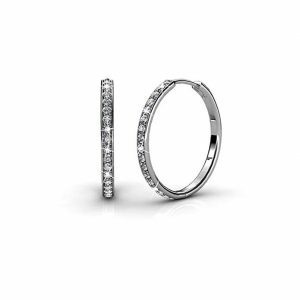 That design sets it apart from most other small hoop earrings simply because it works. We’ve seen others with a little too much Swarovski crystals along the sides. Others can be a little off (size-wise) and thus, uncomfortable. But for sheer aesthetic appeal and comfortability (from the weight to the curves), this is one of our top choices. The pair is absolutely meant as a gift. Look at this way, you don’t have to worry about giving your girlfriend or lover a gift that she won’t like in terms of design and personal comfort. 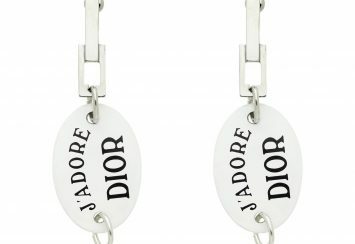 The pair of earrings isn’t just classy, its clean looks give it mass appeal, and it even comes in a pretty satin pouch. This is something to note in the case of a gift. Making an impression is key here, especially if you’ve been looking for something that’ll allow more to grow between you guys. After that, there’s the durability. The pair of earrings is made from Sterling silver, which has been plated with rose gold to increase the looks a bit. In other words, toughness isn’t going to be a problem you have to worry about, while at the same time, the looks department is an area that you’ll instantly notice. Though, do not worry about the earrings fading, as you actually need to use them a lot for that to happen. That kind of combo is certainly always nice to see. Essentially, it’s perfect as a gift that’ll make a large impact, if we’re to talk about how many uses it will see. The hoop measures 12mm which is great due to the comfort it provides. But what we really love about the pair of earrings is the plain look. 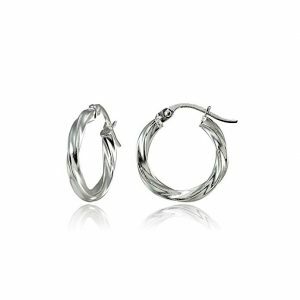 The hoops are made from Sterling silver and they’re not plated with any gold. Instead, a natural silver hue covered with tarnish-resistant plating is what you get and that’s one of the most flexible colours ever! The hoops can be worn by you or you can buy a pair for your children, friends, or even colleagues. In fact, your boyfriend/partner isn’t excluded from this since the pair is unisex. So, you can just buy two pairs and make it your go-to wear. The best thing about this is that the earrings are going to keep up with your relationship no matter the pace you guys set. They’ve made use of Sterling silver and we like it since it drastically cuts down on the price. Just compare it to gold (any colour) and there’s a stark difference. On the other hand, it helps keep expenses low but does not sacrifice the looks nor the toughness. This is not a gift that you have to be worried about since it won’t underperform. The clasp won’t be breaking off anytime soon and the colour isn’t going to fade. In fact, it does have a bit of sparkle to it, which although isn’t surprising, is still good to us. A pouch is thrown in with the package too. It’s nice in the case you want to make a huge impression. Unlike the other previous options, these ones are studded with Swarovski Crystals. 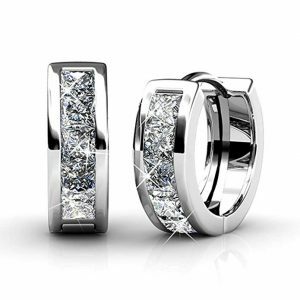 We would have loved to see some Cubic Zirconia here, but the price is right and the stones are really durable too. The pair simply glows when they come in contact with light. It attracts eyes and thus, is perfect for any occasion planned. So if you have a friend, daughter, or maybe even your partner, then just give this to her for her birthday, engagement, or simply for a romantic dinner. Regardless if it’s a cliché or not, stones are rather iconic and women are a large reason why. She should definitely love it. Moving on to the material used, these are made of brass but it’s the white gold that’s used for plating that we love! It’s essentially another way that the earrings use in attracting eyes (the extra layer shines). Nevertheless, we still appreciate the toughness that comes with making a pair of earrings with brass. If the look doesn’t rub off on you, its ability to keep up with the roughest of movements should. This essentially means that while the looks go really well with any situation that you’ve definitely got to flaunt, it’s perfect for places like work, dates, impromptu walks, etc. It’s a jack of all trades in its own little ways. 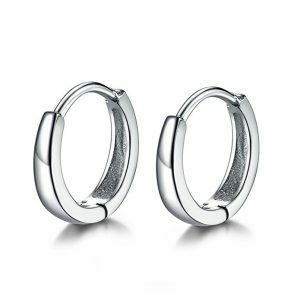 Luckily, they all count, as they form a pair of earrings that make great gift ideas, can be applied personally, and are aesthetically pleasing, like durable. 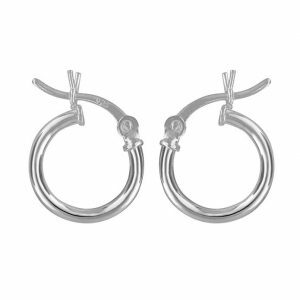 One of our favorite names for a pair of earrings is definitely one that holds the term “Huggies”. It’s cute especially when it does actually hug a small part of your ear. They use Sterling silver as the only metal, and that’s a great decision! It’s durable, sparkles when it’s polished, and can be twisted to form just about anything you can think of. 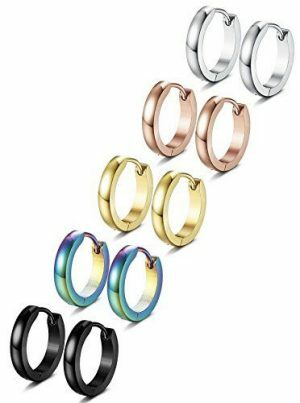 This time around, the form that it takes is a simple round band that hangs just below your ear. That level of simplicity should make it plain, but it just looks like a classic. Perfect for Grandma, mothers, daughters, etc. Following that, it’s where you can apply that fact you now look for. From birthdays and graduations to simple dates, and mature/classy anniversaries. The meaning is timeless care if you give it to your daughter. A gift card will go well with this too. So make sure you include it with the pouch and jewellery box that it comes with. In terms of fashion style itself, the earrings are perfect for all occasions, though make sure you stay simple throughout. The pair looks vintage and that’s one more reason to get it. It’ll go well at work, at the beach, at home, and literally, anywhere you can think of. So in terms of applications, that’s practically limitless! This luckily stays the same on the part of skin tones. It’s a look that suits our tastes. When we’re talking about sheer aesthetic appeal from a pair of earrings, this is one of the best that we’ve seen. There are 6 colors that you can pick from, which are all equally appealing. But what’s the highlight here is the combinations that you can make (36 if you use two pairs) with the 6 colors. They can be applied to multiple piercings, which is perfect for people with just that! It’s great since you’re communicating with them on a personal level. There’s a diversity in fashion tastes no matter the level after all. All of the colors are made from painted stainless steel. Stainless steel is really tough and will resist wear. So a fitting paint job is what is expected this case around (which they delivered on). It’s like the metal has been thickly coated in a bucket of quality paint to act as another layer. So if you’re thinking it might be a great gift, you should make use of it as such. It will stand wear in any of her occasions and the fact that it doesn’t hurt to just give someone pairs of the earrings as a surprise (it’s affordable and even lasts). And in our experience, it does carry a message of love for everybody (family or not). There’s no girl or woman in the case of family who wouldn’t love a family member who pays attention to their needs. Cousin, father, brother—you’re placing emphasis on the care that you have for her. On the women’s part, you can give your partner, son, or any other family member the idea to give it to your daughter. Alternatively, it might have been a while since you’ve given your daughter/mother a pair of earrings. In that case, we think this is the perfect time to do so. You have options here. This one is a bit classier than others on the list. It has a modern and sophisticated look that’ll look great on anyone. At the same time, it adds a health side to things. The pair is hypoallergenic which is great no matter who. That’s one of the reasons why the sophisticated look fits it. The band is entirely made from Sterling silver. Either for its durability or for its price—the material just gets the right combo. Likewise, the fact that it’s attractive (as we mentioned) is great too. So in terms of application, let’s think of any girl or woman you know. For the former, it might be a bit plain, but its “close hug” design on her ear is going to look gorgeous. For women, it’s easy on the eyes and good with any outfit and coupling that fact with the density of Sterling silver, it’s perfect for any area of their life. So you can either apply that fact to yourself or someone close to you. Together with all this, a gift card and a dinner sound even better. Everyone in one place. Alternatively, special occasions like engagements, weddings, anniversaries, vacation, and others are entirely just another application to consider. Cate & Chloe make use of brass which has been plated with 18k white gold to add more aesthetic appeal. Although, the design doesn’t stop there as it uses a row of Swarovski crystals to really make a huge impression. Now that we’ve finished talking about the design, let’s talk about the toughness. Both the brass and the Swarovski crystals are super tough. So if you’re planning a gift that’ll see a lot of use, you could use this. The fact that it also reminds the person you’re giving the gift to of you is a plus. Nonetheless, this is not only a gift for mom or your daughter on her birthday. Sure, the meaning behind you giving her a pair of earrings will be noticed but surely it’s not only meant to be used as a gift. Instead, it’s also a piece of jewelry that you can apply in a variety of ways. If your anniversary is coming up soon, or you have an engagement you have to go to soon, you could try wearing this pair. As a matter of fact, even something like a dinner with your partner is reason enough for you to use the pair of earrings. It looks luxurious and its arrangements of crystals make it a literal eye-candy. The Windshow makes use of a brass band in this pair of earrings. But then it is plated with a layer of 18K gold to give a small hoop earring with an expensive look. We mean, it’s coloured bright gold which is a hue that looks great on any skin and is safe too. So, wanting a pair for either yourself or someone you know is normal. The hue goes with just about any outfit that you have, and despite the size of the pair, it still screams “expensive” at every glance. Continuing, these are super durable and aesthetically appealing which is a mix that most people (especially if it’s to be a gift) will love. Think about this: you have a friend’s birthday coming up and you don’t have any gift as of now. 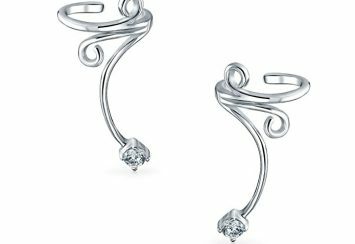 You could combine two pairs of the earrings together with a gift card that tells her to share the other pair with her daughter. We doubt there’s any woman who doesn’t like someone with that kind of interest in her. 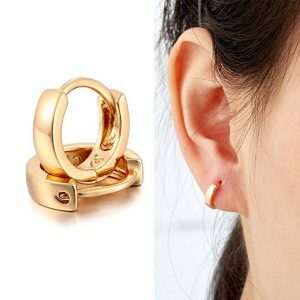 The person who gives that friend the pair of earrings can also be her husband, which will definitely come as a surprise. So you could throw any guy you have that idea. The earrings come in a free beautiful box which is a generous move as you won’t need to buy another for the pair. This is useful regardless of if it’s going to be a gift or not. Unlike other options on the list, this one comes in 2 pairs. One is gold while the other is platinum—with the 1st one known for being expensive while the other is simply known for being eternal. 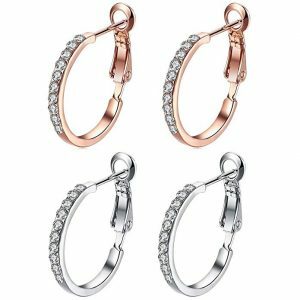 In the case that you’re using the earrings as a gift to give to your partner, she’ll definitely love the stones embedded along the circumference of the circle. We agree that Cubic Zirconia is definitely a looker when you look at the entire thing as a single piece. Moving on to the material used in making the pair, stainless steel is employed and the durability shows in the application. You can wear them to literally any occasion (different tones) that you can think of. In fact, we encourage you to wear them to work. You’re good since they can handle the extra stress. If it’s on other occasions (walks, dinners, etc) that require you to flaunt or even just take things steady and simple at work or dinner, it performs well in those areas as well. Their sizes are significant and they simply just fit in with you. This is another pair of earrings that spots a rose gold tint. The pair looks dashing since they look vintage. At the same time, there are modern elements involved which give a mix of looks that people simply love. Who doesn’t like earrings that look high-class? The best thing about that little fact is that everyone deserves one in their collection. It simply looks good with most, if not all outfits in everyone’s wardrobe (whether simple or complex). As to the type of metal used in making the pair, the company, Obertis opts for 316L stainless steel, which by itself when polished has a nice shine to it. Also, the fact that it holds a clear surface (free from scratches, effects of the elements, etc) for a very long time just makes it one of the better materials out there. All of this is then complemented with a rich hue that won’t fade easily. So in terms of looks and durability, it’s one of the best you can buy. And that’s not considering the application part. You can wear the pair of earrings to work, a dinner/date, school, and really just for everyday use. From that, it’s obvious that the range of people that you can give the earrings to are diverse. For your daughter, cousin, niece, godchild, grandchild, or close friend, it’s a gift that deepens the familial bonds. In a similar way, the same thing can be said for you and your partner since it’s an opportunity to show how you care about her needs. There are different facts and information that always tag along fashion accessories. Like so, small hoop earrings have their own rules. Which face shapes go well with small hoop earrings? To correctly answer that question, you have to know some face shapes. They are narrow, square, round, heart-shaped, and oval shapes. 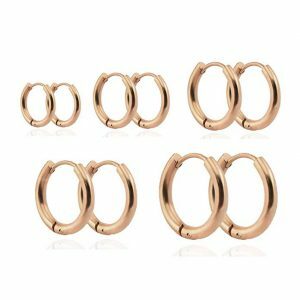 Normally, there should be rules that govern the use of hoop earrings (small ones fall here now) with any of these shapes. But the fact that hoop earrings, whether small or huge are classics comes in the way of those rules. The truth is that hoop earrings, especially the small ones can be applied to any shape. Their antique look which can be modernized with some stones and design changes complements most faces. 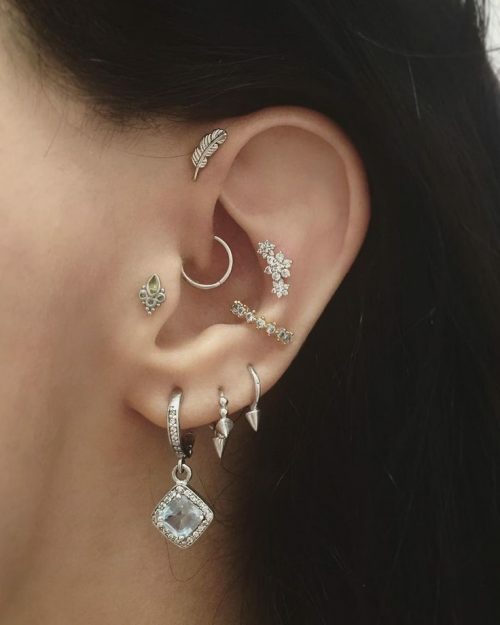 How to wear small hoop piercings? If you have multiple piercings, you can just buy ones with different designs to create different effects as we said. 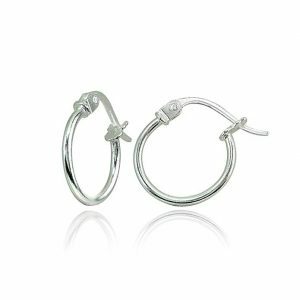 Small hoop earrings are one of the most versatile-to-use types of jewelry available to people. So having your fingers dipped in different ones with varying designs (all beautiful) is a move that’ll spice up anyone’s look considerably. What do hoop earrings mean? On any woman, small hoop earrings look stylish and are in vogue. So, regardless of the other materials added, the shape is really iconic at this point. Everybody knows about it and most even know it has been around for a long time. So, a mix of continuity and femininity (doesn’t mean men can’t wear it) is really clear here. If you’re looking for a good investment in terms of your jewelry, this is one of the types that you should opt for. It’s that kind of jewelry that even when it’s not currently in style on the internet, it still has a huge chunk of followers all over the world. Yes, men can definitely wear small hoop earrings. And that doesn’t exclude big hoops as well. The only thing you have to do is avoid too many stones and feminine colours and the man you’re giving it to shouldn’t have any problem with the look. Ones with intricate designs should be avoided as well since it’ll look unsightly and odd.